One of the best British action movies ever made and the first feature to deal with the SAS who up to that point were a virtually unknown entity. Lewis Collins shows great leading man potential here after years of playing second fiddle to Gordon Jackson and Martin Shaw in The Professionals. Captain Peter Skellen is a hardened veteran who is selected for an undercover mission to infiltrate The People's Lobby, an anti-nuclear protest group who are suspected of planning to commit a terrorist atrocity. This plays for the most part as a spy thriller with Skellen getting close to their leader Frankie Leith (Judy Davis) and there is a realistically painful, winceworthy fight where he is set upon by two overseas officers as part of his cover. But the real action kicks in towards the end when the terrorists hold many people hostage and Skellen has to help the SAS take them down. All this is done efficiently and it's great seeing Lewis carry a machine gun like when he was Bodie. A fantastic supporting cast includes John Duttine, Edward Woodward, Tony Doyle, Patrick Allen, Kenneth Griffiths, Tony Osoba and Mark Ryan, a good two years before he was cast as Nasir in Robin Of Sherwood. Edward Woodward and Lewis Collins in the same film ... what else do I need? Superb stuff, shame there was no sequel. Lewis didn't do much comparable after this in terms of quality (perhaps except 'Jack The Ripper'). Always loved it and brings back memories of VHS videos in the 80s ... this was a must see in the home rental market. I also remember it being premiered on ITV on Boxing Day 1985, although I heard it had to be edited for violence and bad language. It would be shown again a few times then BBC1 showed it in 1999. That was the year I saw it on video. Judy Davis' reasons for wanting to destroy a base in Scotland are ridiculous, but in recent years while watching WDW a few times, I've realized that she and her group were actually working for the Libyans, then fronted by the infamous Colonel Gaddafi. I've got the remastered blu-ray/DVD set and I watched the movie again after Lewis Collins passed away. He was set to do a sequel set in the Falklands but it never happened. I recall going to see this twice in one week when it was originally released in the cinemas back in September 1982. Superb stuff. The Arrow BD - worth every penny. Yes, I thought it was a great film, still holds up well 30+ years on. I was never a Professionals fan, but recalled that Lewis Collins had done the SAS training selection course? Obviously there are several tests to pass, fitness being one of them, he wasn't going to join the Hereford Hooligans after passing the fitness test, but was it a myth or did Lewis really get into shape with 22 SAS Regt? I'm on a roll this week, two new threads of programmes and films I have heard of. Cracking film, as said above, pity there wasn't a follow up. Its a bit like getting two Pointless answers in a row. Admittedly rubbish in the whole great scheme of cinema, but I hold it in high esteem!! Collins somehow finding the right balance between that of a total b*ll-end and one of Her Majesty's more dangerous attack dogs... And in the process ensuring that you'll be rooting for him all the way as he's pitted against a bunch of anti-establishment, revolution crazed pinkos!! Loads of quotable corny lines. Biggest let down: not enough use of flamethrowers! Really fun 1980s film with some performances. Lewis Collins and John Duttine were both great. I did find Lewis' big 80s hair a bit distracting though. According to a source, it is indeed true. I have seen pictures of him on military training exercises dressed in camouflage gear and carrying a rifle. He nearly made it into that SAS regiment but was refused because of his celebrity status. From what I gather, he was at the peak of his physical form and tackled anything they threw at him. In The Professionals, he looked and felt every inch the hard man and carried & fired a gun convincingly, whether it be a revolver, a semi-automatic or a machine gun. Yes, his hair cut was dreadful. Lewis probably WAS keen to join, but an own goal highlighting this not long after the Iranian hostage rescue still fresh in peoples minds from his PR team meant he was stuck with it. Ace , great topic for a Death Match - Lew's awful barnet in WDW versus Martin's dreadful perm during The Pros. That must be one of the most controversal movies with the critics ever made. You find everything, mainly they say its completely and illogical cr*p , some also say its a great movie. I myself like it for Lewis sake of course, but the story really is weak as hell. Always wondered why Richard Widmark took part, should have been way below his paygrade. Richard Widmark had also appeared in the 1975 Anglo/German Hammer horror 'To the Devil a Daughter' and his performance in that clearly indicated he was taking anything to pay the bills. He was also in the dreadful 'The Swarm' (filmed in 1977) and the equally awful 'Bear Island' in 1979. 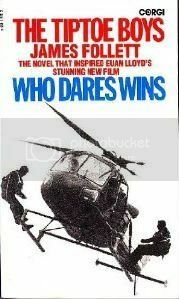 So, I think it is no surprise he turned up in 'Who Dares Wins'. He was a good actor in his day but by the mid 70's he clearly couldn't give a toss, telephoned in his appearances and picked up his cheque. Yes, it's clear indeed Widmark was doing it for the money, but I did like his argument scene with Judy Davis. It was quite intense and also unintentionally hilarious. I have the original novel WDW was based on called The Tiptoe Boys and it is a lot more believable in some ways and more brutal. We get into Skellen's mind a bit more, especially his disenchantment with the SAS and Frankie's team are a bit more clever and ruthless in this, causing the deaths of many SAS officers near the end. Was Skellen disenchanted with the Regiment? I thought that was all part of his cover story. I watched this on video when I was probably around 12 or 13 and absolutely loved the finale. The SAS storming the house was unlike anything I'd seen before and I must have re-wound and watched that part of the film a dozen times before my Dad took the film back to the video hire shop. When I had it on video, I used to rewind and re-watch that bit too. I thought it was superbly staged and also liked seeing Skellen run around with a machine gun and pick up an extra clip. He was indeed because a friend of his had been killed and he blamed the SAS for it. Would the detail and accuracy of the action sequences have been seen in any previous productions or was WDW breaking new ground? Watching this would certainly have opened many peoples eyes as to how efficient and professional the SAS were. I think WDW was breaking new ground in showing how the SAS handled terrorist situations and dealt with them. Before that, we had The Wild Geese which was just an enjoyable, old-fashioned action romp about mercenaries, a UK version of The Dirty Dozen. We wouldn't see anything like this again until on TV in 1988 when The Zero Option was premiered on 19th November that year. It began with a hostile takeover and the SAS responding to it, but this time, there was tragedy. You can see why I went to see it twice on its initial week of release at the cinema. Both my brother and cousin told me that they thought WDW was rubbish. I think it was mainly because of the plot. WDW was never going to win any Oscars but it is a great action movie and one of the great movie mysteries of all time is why Lewis's film career stalled in such a spectacular way after 1981/82. He just nose dived off the cinema radar into three cheapo Euro action movies that were nothing more than OK. I remember seeing that with Rik Mayall as the leader. Here is the book I bought back in 1982, as mentioned by dsc, long since gone from my collection. To tie in nicely with this thread,C4 has SAS:Who Dares Wins on at 21.00 tonight, it's a series about selection process......we can decide IF Lewis would have succeeded by watching this. I have my doubts. I think I'll have a look at that. Ace, do you reckon Lewis would have been able to qualify as a Royal Marine? Maybe that might have been up his street, because there was a producer/writer called Nicholas Corea who worked on popular US shows like The Incredible Hulk, Police Woman and Airwolf. He'd been a US marine who fought in the Vietnam war and his novel A Cleaner Breed was loosely based on his own experiences as a soldier.